Dr. Wes Youngberg presents the latest scientific information on re-engineering genetic health risk. There is hope for those who choose a new direction. True, you can’t change your genes, but recent experiments indicate that you can throw the switch and turn disease promoting genes off and health transforming genes on. All of us carry at least some genes associated with diabetes, cancer, Alzheimer’s, auto-immune disease, depression or heart disease. Dr. Youngberg not only identifies the problem but encourages you with practical solutions. 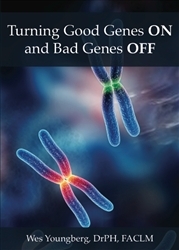 Filmed February 2010 at the Festival of Health in Orlando, Florida, Dr. Wes Youngberg’s spirited challenge on how to turn Good Genes ON and Bad Genes OFF gives hope for all of us. This DVD give excellent advice on how to have a major impact on our health by our everyday choices. Copyright 2010. Includes one DVD. 60 minutes.